Most rapper names sound like orc names already. =) We had great fun when playing Gorkamorka in the 90s. Had a gang called Bumpa Stikkaz being rather hip hop inspired. Stikky Fingaz was in it. As was Blak Kopp – my nob named after the old KRS-One song. Busta Rimz and Gard Yagril would work well too. I better stop now though, or I’ll be at it all day. The Notorious G.I.T. thing made me laugh a couple of years ago, so I decided to add it when an opportunity presented. A plastic gretchin kit with a seriously O.G. glyph plate around the neck of one of the bodies that also supplied a baseball cap head made it a done deal. When it comes to hip-hop (and most music) I am really only a tourist, primarily interested in a cheap gag, more Carlton than The Fresh Prince (to use a vintage, terribly unhip reference). Beyond “Giddy” here I cant imagine many more additions. Apart from maybe Fifty Teef. Im finding that with orks and gretchin in particular its really very easy to take a conceptual whim and run with it. I have pirates on the way and plans for some totally stupid “Minderz” at a later date, with more ideas presenting themselves faster than I can get them made or played with. The glory of Blak Kopp was how it meant something like “Big Boss” according to the glossary in the Gorka Morka rules (or it could’ve been “Da uvver book”). “Kop” means hill, head, helmet, top, that sort of thing (there is a fan GoMo scenario called “Nob uv da Kop” which is a King of the Hill type thing. So “Black Head” or something? 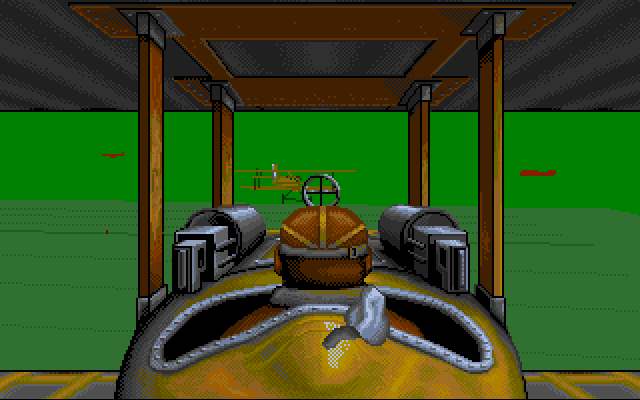 Ah yes, THAT was it… Dark Helmet. AKA Blak Kop =) It’s been a while since I sold my set. Silly me. Sweet buncha grots you got there. They must be some tiny magnets you’re using on the hand and guns. A few crusty old grognards mention various GW plastic kits and how the metal Brian Nelson grots that directly inspired this set are better than them. No question, the Nelson models of that era are beautiful. The convenience of this plastic kit with not so many parts as to be a chore to assemble, while still enough parts to make an entertainingly varied and fun to paint unit trumps them IMO. Simple to convert and more durable too. The box of ten grots and a runtherd with herd squig for €13 is pretty good value in pure miniatures terms (although I dread to think how many would be required for a feasible unit in 40K). Magnetising Giddy was an experiment to see how useful and feasible it might turn out to be. It was fun, but not terribly practical. The magnets are strong enough to hold light plastic guns like that to a model, but to keep the gun orientation normal, two pairs of magnets forcing alignment would have been best. But the little guys fist wasnt big enough. I cant remember what size magnets I used (I assembled the model a couple of years ago), but I can check if you like. The little guy will be bustin’ caps on a table near you one way or another anyway. It’s hard not to love grots/gobbos/goblins, the cheeky little tykes. My ears always tend to prick up when magnets get mentioned. I’ve used them as couple of times, but I can see they day when I need to get my mojo on when it comes to magnetising, the idea of painting one model and configuring it multiple ways with a few extra weapons/arms appeals greatly. Back in my tournament 40K days the idea of each ten man squad having its own easily swapped out special/heavy weapons and sarge equipment would have really appealed. Now that I only paint smaller forces its not worth the hassle. I can just paint a sixth and/or seventh cool one piece model and leave it at that instead. Painting the weapons separately is quite fiddly I find too: it takes longer than it should and I dont get painting results of the same standard. That pistol that the G.I.T. has is really too small to be painting on its own: its a wonder that I havent lost it. Yet. I have added a countersunk magnet to the various hard points on most of the vehicles that I have painted over the last few years though. I also mounted a range of suitable weapons on small washers. So now all the vehicles have unarmed and various armed configurations, which is satisfying. Im working on a vehicle at the moment, a lighter/lander/shuttle type thing. I made the front cockpit section removable and magnetised for storage and possible transport reasons. I am finding more uses for magnets, but Im not convinced that swap out infantry weapons are worth the hassle. I would be thinking more for stuff like dreadnoughts, banner bearers, that kind of thing. You’re probably the only guy in the world that has painted three weapon options for a single grot, in fairness. Thanks Peter. 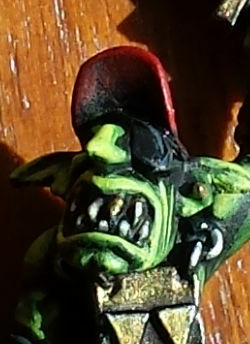 I have a gold tooth painted on almost every or and gretchin that I have painted actually. In fact the plan was to paint all of Giddys teeth gold but on the evening that I finished that batch of green skins off I completely forgot. I may go back to it. I took a quick and dirty phone photo to highlight the quick and dirty paintjob on the guys mouth and amended the post accordingly.